Knee pain can be caused by structures in the knee as well as pain referred from the back or feet. If you do decide to book to see one of our Chiropractors, Osteopaths or Physiotherapists we would go through a case history to try and find out whats causing your pain. We would ask questions like how long you have had the pain, any aggravating factors, does the pain travel anywhere or just stay in the same place, does it stop you sleeping? These will all help us in determining what's wrong. We would then do an examination where we would check the movement in your joints. We would feel for any joints that might be locked and check the muscles for any tightness. We would also check your reflexes and sometimes your blood pressure to help us come to a diagnosis. The most common symptoms of a meniscus tear include swelling, locking of the knee and a sensation of the knee 'giving way.' It can be caused by twisting, squatting or changing position. Most tears will just need conservative treatment such as Physiotherapy, but if the tear is large then an operation may be needed. Upgrade to see how physio can help. Cruciate ligaments are deep within the knee and stabilise the knee. Anterior cruciate injuries tend to occur in a twisting injury or if you overextend the knee. If you injure the ACL it is quite easy to also damage the meniscus and the medial collateral ligament as well. Posterior cruciate injuries can occur through things like striking the dash board or falling on a flexed knee. With both injuries it depends on the severity. They tend to be graded 1-3 with a grade 3 injury more likely to need an operation. It is important to seek advice. Physiotherapy can help a grade 1 and 2 straight away or a grade 3 post surgery. This muscles originates in the groin and goes down the inside of the leg to the knee. It is used in hip adduction and knee flexion. A strain to the gracilis can be caused by overuse or an injury. It is important to regularly stretch this muscle to reduce the risk of injury to it. Medial (MCL) and Lateral (LCL) collateral ligament strains are common. These ligaments are situated on either side of the knee. Injuries are graded 1-3 by an MRI or ultrasound depending on how bad the tear is. Grade 3 tears are usually operated on but Grades 1 and 2 can be treated with a brace and crutches initially, gradually returning to activities and doing exercises to restore movement to the knee. Our physiotherapist can help a grade 1 and 2 straight away and a grade 3 post surgery. The popliteus muscle is a little muscle at the back of the knee and is used for unlocking the knee when walking. Injury can occur through road traffic accidents or if the knee is over straightened. Over use injuries tend to occur in runners they tend to come on slowly with tight hamstrings being involved. Osteoarthritis typically causes pain when you move the knee or towards the end of the day. You can experience creaking or grinding, swelling and stiffness. Pain can vary but it is worth getting it checked out as to begin with conservative treatment like massage, ultrasound and acupuncture from a physiotherapist or chiropractor can help but as the knee deteriorates injections and then surgery maybe needed. This is an auto immune disorder and can be diagnosed through a blood test. RA can cause swelling and redness symmetrically on both sides of the body. The knee can feel stiff and have less movement. Pes Planus is another name for flat feet. When the arches drop in your foot the whole bio mechanics are affected and this tends to put more pressure through the knee which can lead to knee pain or poor patella tracking in the knee. Typical treatment would include the recommendation of orthotic arch supports and addressing muscle imbalances. Knee pain can be referred from the lower back. A spinal disc pressing against a nerve root can be felt behind the knee and down the leg even if you have no back pain. Through thorough examination this cause of knee pain would become apparent. Treatment would then focus on addressing the spinal problem (see lower back section for more details) as well as addressing muscle imbalances created through abnormal gait and strengthening of any weak muscles. This mainly affects active adolescents. Overuse of the quadriceps muscle seems a common cause. The quadriceps attachment can get red and sore and a bony lump can appear through a piece of the bone being pulled away from the tibia. Prepatella bursitis involves inflammation of the bursa at the front of the knee. The lump can be as big as a grapefruit and is traditionally called housemaids knee as it can be caused by kneeling. Upgrade to our Silver package for information on the different diagnoses. Here is one example of some Knee exercises - upgrade to silver to see more. 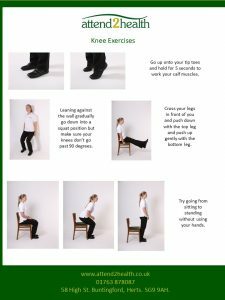 Here are some simple knee exercises to help. Make sure any movement is pain free. Upgrade to silver to see more.